It was time to wear some more edge off the tyres on the Super Tenere to follow up on the jaunt in the Snowy Mountains two weeks back. 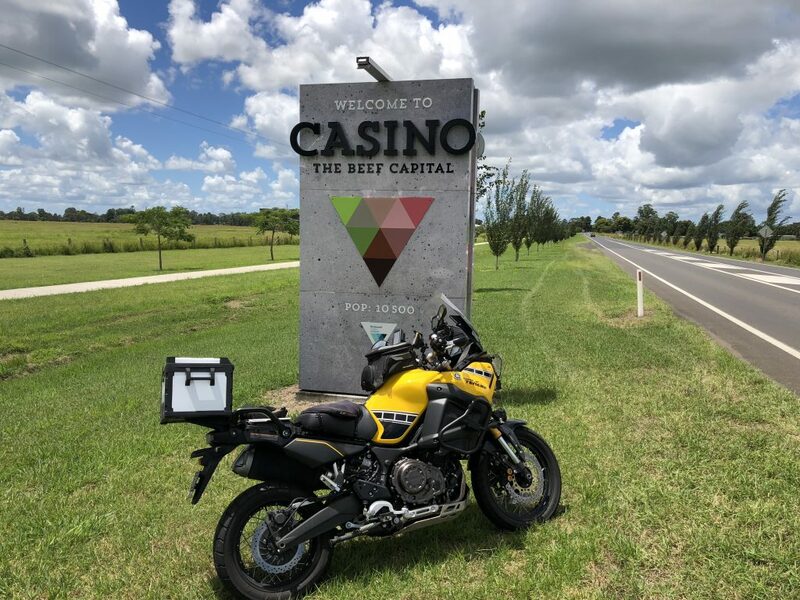 I decided to look again at the multiple Great Dividing Range crossing ride I did on the Africa Twin early last month only this time riding the loop the other way. 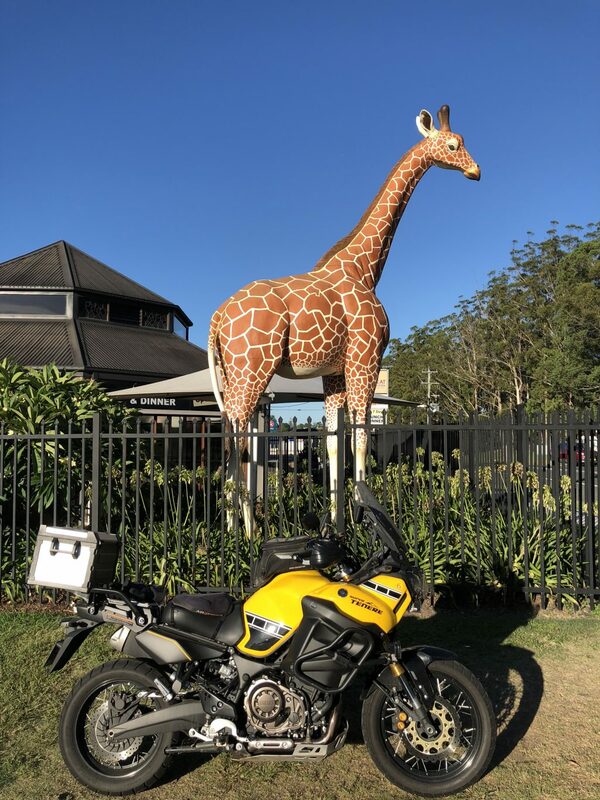 The ride kicked off just after 3am with a dark run up the slab to the Port Macquarie Donunt for some fuel and a corner docket. The sun rose as I headed west up the Oxley Highway through Wauchope and Long Flat. 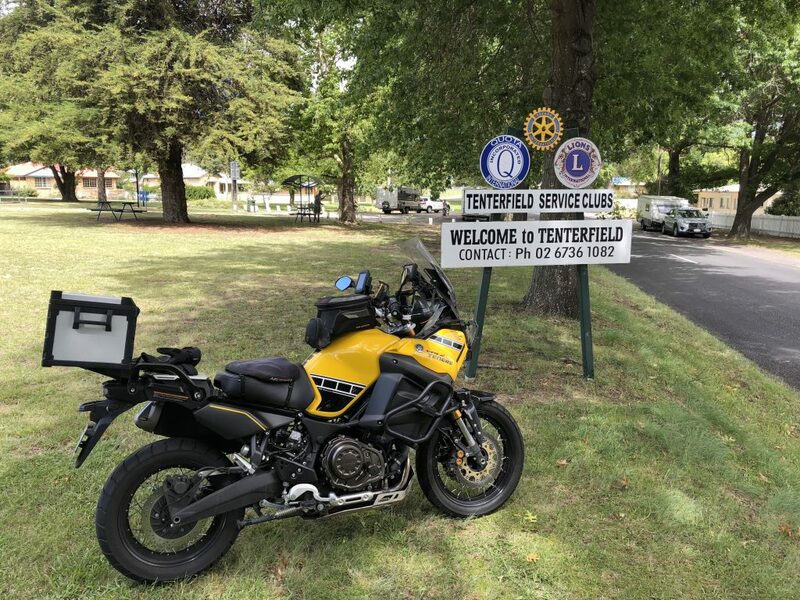 I had a marvellous clear run up the Oxley giving 3rd and 4th gear and the upper rev range of the Super Tenere a decent workout, within the new speed limit of course. It’s a good time of the day to be on that road I reckon. I sharpened up the outside of the boots as well. Popping out at the top of the mountains and heading down Yarrowitch Valley pockets of fog were visible in a sensational view that photos don’t do justice (at least mine don’t). 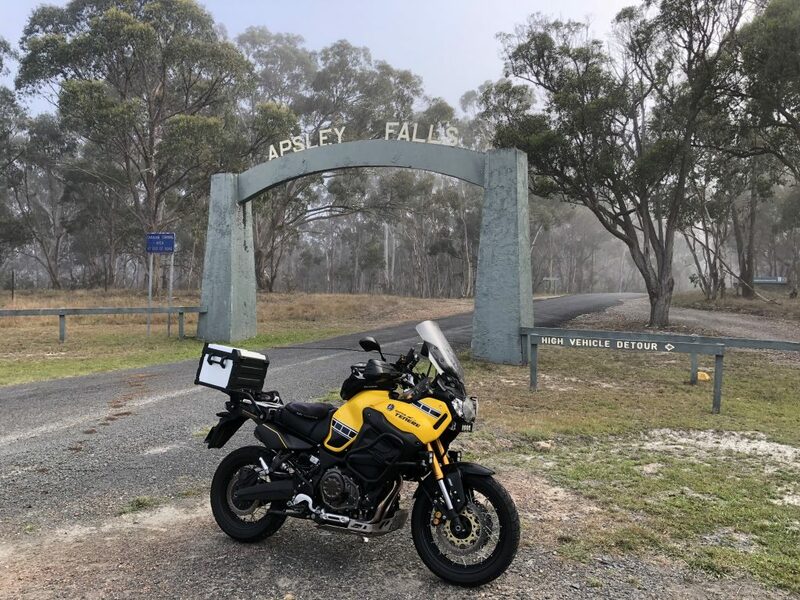 A quick pic at the Apsley Falls gate, the light fog there was about to get a whole lot heavier, although the bike, boots and exposed parts of my Klim suit were already wet here. Through Walcha and towards Uralla the fog got pea soup like for a while and quite cool but cleared up soon enough. I rode through Uralla along Thunderbolts Way to Inverell where I fuelled up again. East along the Gwydir Highway towards Glenn Innes I got to see the wind farm and then happened across the first lot of roadworks for the day. BTW, I took this pic then filtered to the front of the queue. 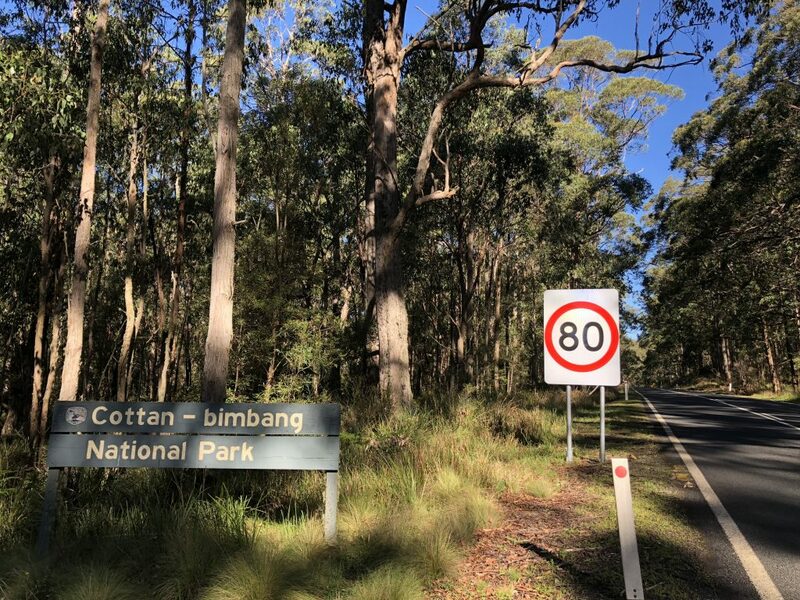 Through Glenn Innes I took a left on the New England Highway for a transport leg to the next set of curves. 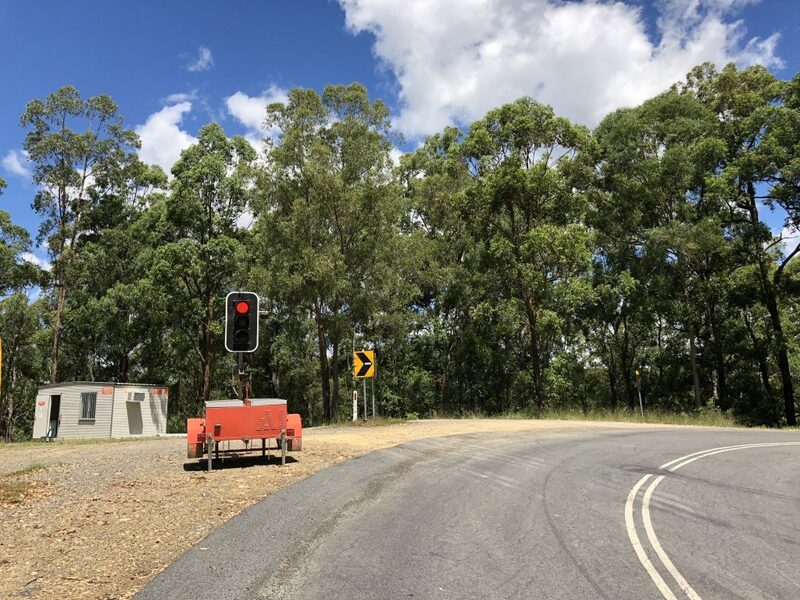 A left at Tenterfield onto the Bruxner Highway. 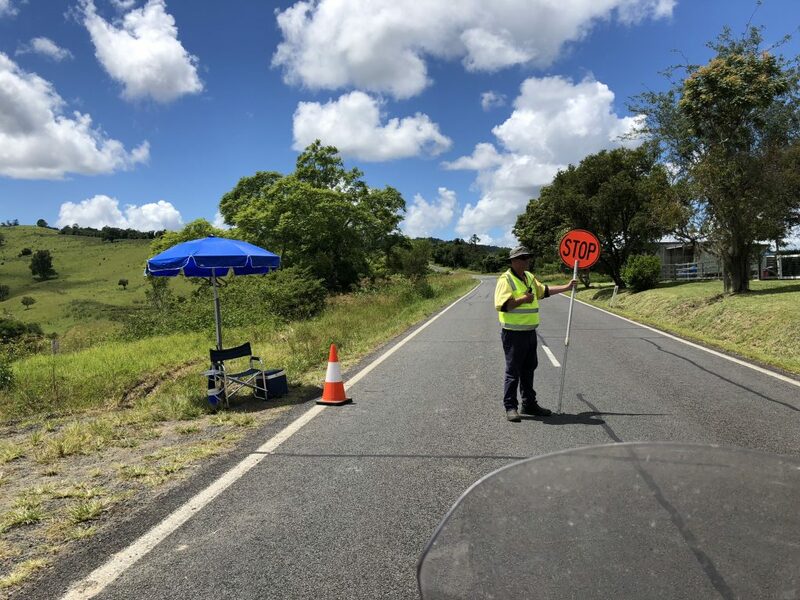 But of course this guy had set up on the Bruxner just to wait for me! Casino was next for fuel and a corner docket. At Casino I turned south on the Summerland Way. It was warming up and, unusually for me, I needed to stop in some shade and do a lap or two around the bike, eat some sultanas and a muesli bar and have a big drink. It had been a big week of running, maybe it was catching up. Anyhow I came good quickly and off I went. Through Grafton South I got onto the Armidale Road, one of my favourites, particularly in this direction. It’s a winding, gnarly bit of tar that they seem to have decided to do some work on…again. and again further up the road. Usually on a 1600k day I like to take time to take a few scenic snaps etc, time off the bike is always good but at the moment I’m trying to be disciplined and efficient keeping my stopped time under 1hr 30mins for the day. Some of these roadworks stops were longer than a fuel stop. This guy wouldn’t look at me while I had the camera out 🙂 BTW, there’s loose, soft gravel around this bend, 35kph would still be nasty! This road’s surface is pretty ordinary, it’s narrow, there’s enough traffic to make you glad you are on a motorcycle and don’t take up the whole lane. If you drift right it’s at your peril and keep an eye on the left edge, it disappears occasionally. It was still fun and certainly dials in the focus trying to maintain an overall average in these conditions. The next stop was Armidale for fuel then back down the New England Highway to Uralla and Thunderbolts Way to Walcha. 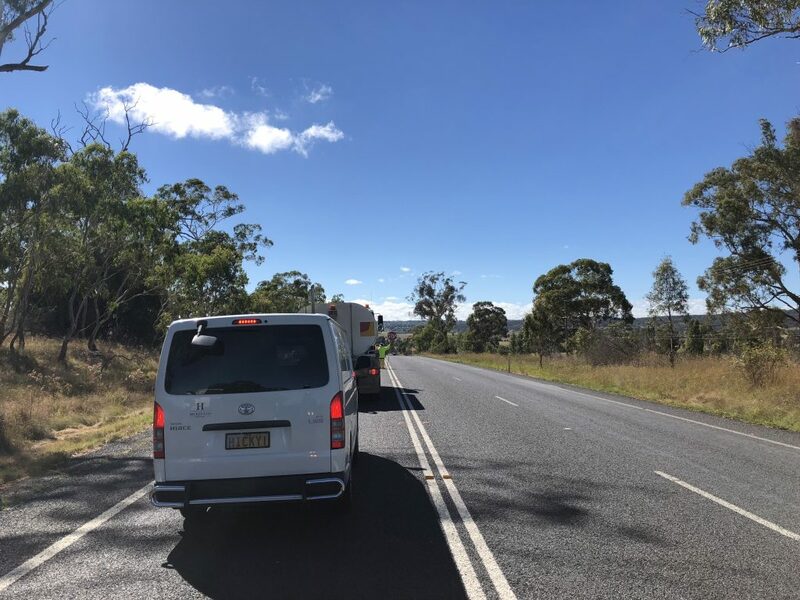 Between Uralla and Walcha I saw two Highway Patrol cars and rode past a speed camera. I was grateful I don’t speed, I like having all my points. You have to wonder why this stretch of road commands so much attention. 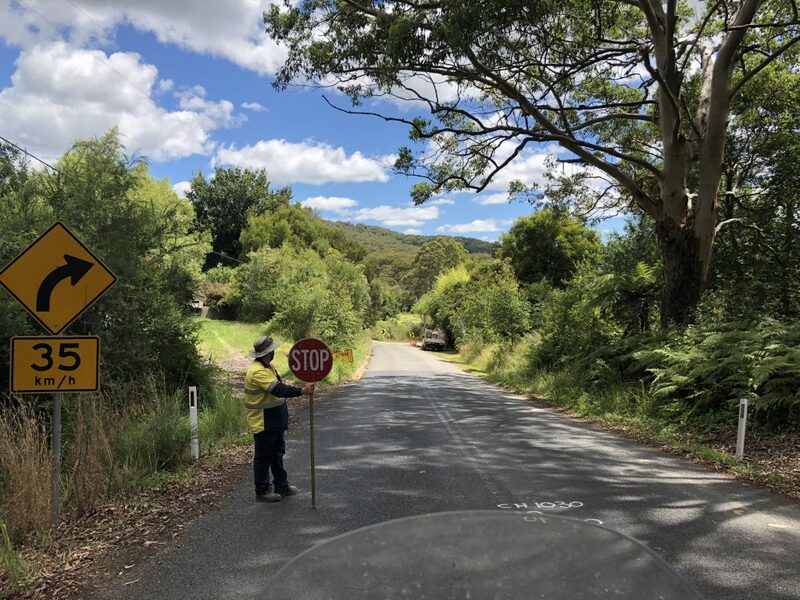 I rode through Walcha and turned east back along the Oxley Highway. The afternoon views of the Yarrowitch Valley were as good as the morning, just no fog. I happened across this newish sign again. It’s a tragedy! The run down the mountains was mostly clear, one car, one truck and a caravan that thankfully didn’t hold me up for long. The sun was still high(ish) heading through Long Flat and I finally got a chance to stop at the Bago Tavern to take a photo of their giraffe. What a giraffe has to do with Timbertown I guess I’ll never know. Check out the sky though, what a superb day to be out riding! I refuelled at the PMQ Donut and took some time in the McDonalds to try the only Chicken Big Mac I’ll ever eat in my life. I called the family to let them know when to expect me and enjoyed the aircon while I caught up with my friend’s lives on facebook over a soy latte. It was still light when I left there and the road south gave me a fantastic view of the sunset but no decent place to stop and grab a shot of it. My finish docket at the local servo was just before 9.30pm and they guy behind the counter knew I was there just for a Cherry Ripe. The young guy who saw me off this morning was back there too. I could see him trying to process why I’d be back after all this time. I’ll spare you the photo of the Cherry Ripe, it’s gone! Interestingly the MA was down on the similar ride I did on the Africa Twin but the OA was better. It’s all about the slower roadwork zones bashing the MA with less stopped time this ride boosting the OA. Timing wise also encountered more School Zones than last time. It also might mean that although I had to wrestle the AT and it’s 21″ front and knobby tyres around the corners they clearly didn’t slow me down. Nice!